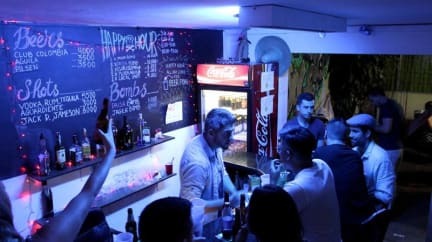 The best party hostel in Medellín by far! The staff was great, the same for the music (no reggaeton) and a super nice atmosphere. The bar is open 24/7 and the happy hours are just amazing. The location was good as well, next to the metro station. Great location if you want to watch a football match as well, the stadium is basically next to the hostel. Great party hostel to meet new people to experience the awesome city of Medellín with! Although it wasn’t fully booked, I had an amazing time during my four night stay at Paisa City. The staff is really friendly and makes you feel right at home. As the football stadium (you MUST visit a game, but make sure you are in the right stands) and metro station are right around the corner, the location is perfect too. Sick party hostel. Just a little bit too small but great in overall. Ver van alles, leuke sfeer en prima douche maar ik zou het niet aanraden vanwege de locatie. Receptie spreekt amper engels en weet niks over medellin.